TCNJ utilizes a text emergency-alert system as one of the most direct means of providing time sensitive Information the significantly impacts the campus community. These emergency-alerts send warnings, information, and updates about any issues that present a threat to the safety to students. It ensures campus community is informed and safe. This system also provides developments that significantly impact our campus and require time-sensitive distribution of information. Information is also distributed through additional channels, such as mass e-mail, TCNJ voicemail, our parents listserv, and TCNJ Web pages. 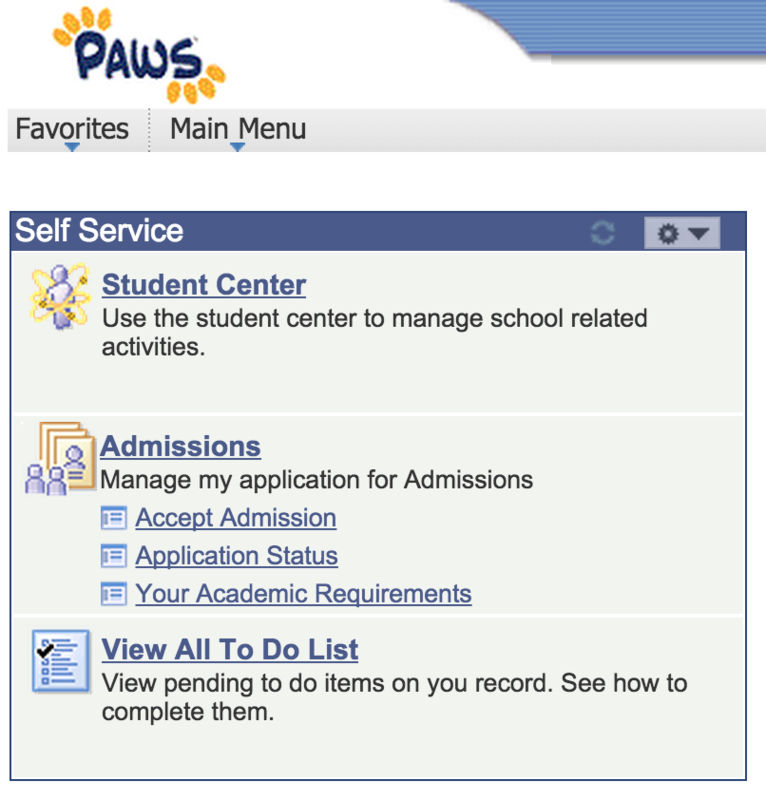 Please ask your TCNJ student to enter your voice or text-messaging device number(s) in PAWS. Enter your text-messaging device number in PAWS using phone type “Text Alert.” Regular text messaging rates apply. Step 1: Navigate to PAWS on TCNJ Today Home page. Step 2: Select the “Student Center” link. Step 4: Select the “Add A Phone Number” button and select the “Phone Type” of “Text Alert 1.” Add your cellular telephone number (including area code). You may designate two additional text cellular numbers to receive text alerts by using phone types “Text Alert 2; Text Alert 3.” You may also designate up to five voice telephone numbers to receive voice alerts by using phone types “Voice Alert 1; Voice Alert 2; Voice Alert 3; Voice Alert 4; Voice Alert 5.” Phone types listed as “Voice Alert” may not receive all emergency-alert communications. No voice messages will be sent if a “Text Alert” number is not entered. Step 6. Select “Add A Phone Number” and select “Voice Alert 1-5″ or “Text Alert 2-3” as the Phone Type. Add your telephone numbers (including area code). Enter your text-messaging device number in YESS using phone type “Text Alert.” Regular text-messaging rates apply. Step 3. Select “Add a Phone Number” button. Step 4. Select “Text Alert” from the drop-down box and enter your phone numberr in the “Telephone” box. The Phone Number field is formatted so you can enter only the numbers and it will format the field for you. Step 5. Select the “Save” button. You may designate two additional telephone numbers to receive voice-message alerts by using phone types “Voice Alert 1” and “Voice Alert 2”. Phone types listed as “Voice Alert” may not receive all emergency-alert communications. No voice messages will be sent if a “Text Alert” number is not entered. Step 6. Select “Add a Phone Number” button. Step 7. Select “Voice Alert 1 or Voice Alert 2” from the drop-down box and enter your phone number in the “Telephone” box. 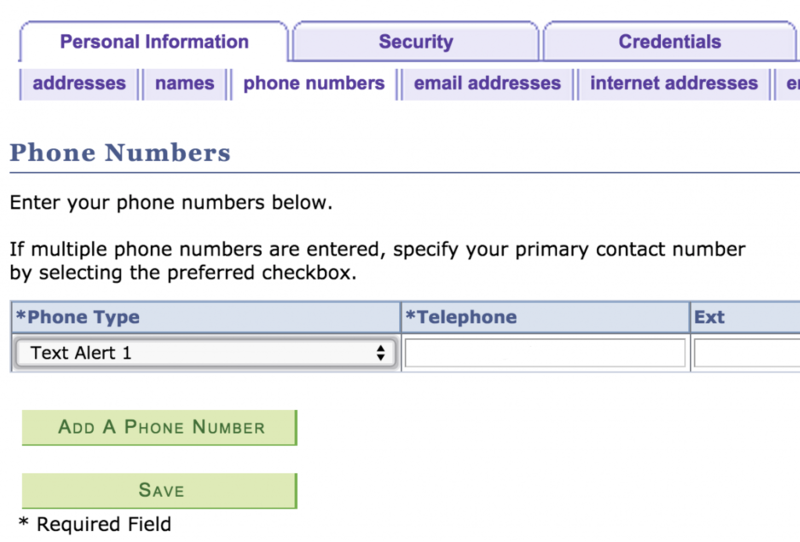 The Phone Number field is formatted so you can enter only the numbers and it will format the field for you. Step 8. Select the “Save” button. You can subscribe to TCNJ’s emergency-alert system by logging into the systems above and entering up to three cellular telephone numbers in the “Text Alert,” ” Voice Alert 1,” and “Voice Alert 2” fields. Students/faculty/staff must enter their cellular number in the “Text Alert” field, because numbers entered in this field will receive text-message alerts whenever the system is activated. The “Voice Alert” fields will provide voicemail messages, not text messages, and will not be used in all situations. These fields can be filled with additional student/faculty/staff cellular numbers or those of parents or spouses whom you wish to receive TCNJ’s emergency alerts. These fields will not be enrolled if the “Text Alert” field is not filled. TCNJ is providing this service at no cost to students, faculty, and staff members. Cellular service providers may charge a fee for messages received, if you are not enrolled in a text-messaging plan, but TCNJ will use this system as judiciously as possible. Cell phone numbers provided to The College of New Jersey for the purpose of receiving text-message emergency alerts will not be used for any other purpose by the vendor supplying this service. The vendor has also agreed to keep this information confidential. Below are several sample messages that could be distributed under appropriate circumstances. The actual message sent in a given situation may vary. Due to the character limitations associated with text-messaging (approximately 160 characters per message), TCNJ alerts will frequently direct recipients to another communication channel (TCNJ home page or e-mail) for more complete information. These sources may not be updated as rapidly as the text message is delivered, but information will be posted or sent as quickly as possible. TCNJ weather closing. All classes canceled and offices closed today. Visit www.tcnj.edu for details soon. Inclement weather has caused a delayed opening today at TCNJ. Visit www.tcnj.edu for details soon. TCNJ facility closure – (insert facility name here). TCNJ e-mail will provide details soon. TCNJ timely warning of criminal activity. TCNJ e-mail will provide details soon. TCNJ Emergency Alert – Stay away from (insert location here). Visit www.tcnj.edu for details soon. TCNJ Emergency – Potentially dangerous situation on campus. Remain in or proceed to secure location until further notice. TCNJ Emergency Alert – Potential danger has subsided. Visit www.tcnj.edu or check TCNJ e-mail for more details soon. Is this service just for cell phones? TCNJ can send messages to any device that can receive text message (SMS) through cellular service, including many cellular telephones, some text pagers, BlackBerrys, and some wireless PDAs. The rate at which messages are received depends upon your cell phone provider’s capabilities. This could be instantaneous or could take an extended period of time. TCNJ and its text-alert system have no control over the speed with which your cellular provider delivers messages. Due to the limitations of text messaging, messages will be very brief and contain vital and immediate information. More information will be made available through other communication channels, such as TCNJ e-mail, TCNJ Web pages, and TCNJ voicemail. Can my parents or spouse receive TCNJ emergency alerts on their cell phone? You can enroll up to three cellular numbers in TCNJ’s emergency-alerts system by entering them in the “Text Alert,” ” Voice Alert 1,” and “Voice Alert 2 ” fields in the PAWS or YESS systems. Students/faculty/staff must enter their cellular numbers in the “Text Alert” field, because numbers entered in this field will receive text-message alerts whenever the system is activated. The “Voice Alert” fields will provide voicemail messages, not text messages, and will not be used in all situations. These fields can be filled with additional student/faculty/staff cellular numbers or those of parents or spouses whom you wish to receive TCNJ’s emergency alerts. Does signing up for TCNJ’s text-alert system cost me anything? There is no cost to sign up. The only charges you incur would be the normal fees charged by your mobile service provider for receiving text messages. What if I don’t have a cell phone or mine doesn’t have text messaging? Text alerts are just one of the communication channels used by TCNJ in the event of an emergency. The emergency-alert system is not replacing TCNJ’s other methods of communication; it is simply enhancing the College’s options for distributing information rapidly.